bama with 39 cases account for 47% of the total. I poliovirus has been recovered from two of these cases. initiated by early next week. Counties, P vania a rCamde Co ty, New Jersey. and Scarlet fever ............ 2,930 3,085 -- 247,717 229,462 .
shown in the accompanying figure. shown in the table (right). areas not yet reporting cases. remarkably similar for all ages. pected weekly average of 5,960. + 4 4 4 .4.
characterized by chills, myalgia, etc. 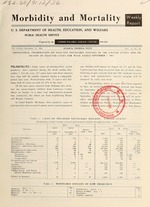 index for Aedesaegypti of 44% and an adult index of 68%. tinuing; mosquito control activities are in progress. examination of portions of brain tissue taken at autopsy. which had been in a fight with another dog on May 30.
was, therefore, not available for laboratory examination. was reported September 9 from East Berlin.